It costs you a lot of time. Each year Americans are sick more then 4 billion days. It costs you a lot of money. They spend almost 950 billion dollars on direct medical costs. But the biggest cost of all is the cost of a life. Over 160,000 die due to infectious diseases as the underlying cause of death. REQUIRES A REAL BLACK LIGHT & A DARK ENVIRONMENT! ALL OF OUR LIGHTS ARE REAL BLACK LIGHTS! BUYING CHEAP NON UV LIGHTS WHICH ARE COMMONLY SOLD WILL NOT WORK PROPERLY ON OUR PRODUCTS! Germ Juice� Lotion Simply applied to hands will reveal a bright blue glowing effect under longwave black light. Hands are then washed and viewed again for traces of Germ Juice� Lotion to show improper cleaning. The darker the training area the better the effects. Use only approved longwave lights. Has many practical uses then just hand washing. Great for marking non porous surfaces, toilets, sinks, counter tops, etc, to be certain cleaning staff are actually cleaning. Unlimited uses. Germjuice� Dry Powder Is a unique formula for instructors who prefer a dry method of training. It works identically as germ Juice but is a dry powder that is massaged into the hands then viewed under longwave black light to show the presence of simulated germs. Hands are then washed and viewed again for traces of germ powder. Germ Powder� is great for the demonstration of contamination and transmission of germs. Students can use to show hand to hand germ transmission as well as cleaning methods to virtually any objects or items where proper cleaning & training are necessary. 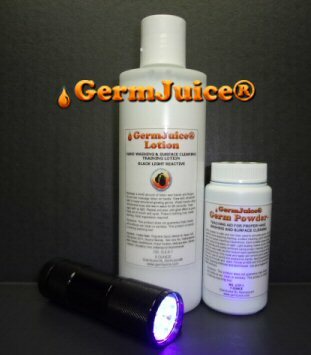 Germ Powder� glows in the dark after light exposure & also glows under standard black light. Lightly applied to any area's can show proper cleaning of carpets, hard surfaces, linens, etc,. Germ Juice� Lotion Kits Choose the right kit for you or purchase items individually and design your own. Germ Juice� and Germ Powder� contain simulated germs, and the black light lets you become the "germ CSI Police"! Obtain permission from parents when training children. Never allow anyone to look directly into ANY light, which this includes our long wave black lights which are considered safe if avoiding looking directly into light. Germ Lotion Ingredients: Purified Water, Propylene Glycol, Mineral Oil, Stearic Acid, Cetyl Alcohol, EDTA, Glyceryl Stearate, Aloe Vera Gel, Triethanolamine, White Protopet, Dimethicone,Propyl Paraben, Methylparaben, Allantoin, Carbomer, Diazolidinyl Urea, Iodopropynyl Butylcarbamate.